One positive is that I am trialing a new gym for the end of February and rest of March. This gym is also a park district from the next town over. It has A LOT more amenities, but also costs significantly more than my current membership. I’ve had a gym membership since I was in high school. Some of have been fancier than others, but I really do LOVE a big, shiny, gym with lots to offer. It’s not something I’ve had since moving in with the BOY a few years ago. So…when I stepped in the door of this gym last weekend to play tennis with the BOY, I was smitten from the start. They have a 25 bike spin studio (my current gym has about 9-10), tennis courts, two pools, well lit clean locker rooms, fit people, a rock climbing wall, a triathlon club, and a lot of classes early in the morning. Can’t you see the appeal?! I’ve always been a bit of a gym snot and I just felt right at home here. It reminded me how much I am missing at our current park district. Another bonus is that it will allow the BOY and I access to tennis courts until we can play outdoors. AND, it’s not on the way but not out of the way to my newer job. Worth a shot in my mind. This morning, I tried out the new gym. I went to the 6am spin class. I loved that the gym was busy but not overly crowded. The people were friendly and you could tell they were a consistent crew. I felt way more at home. The locker rooms were clean and easy to get ready for work. It was so different from my old days at the big commercial gym. I even took a few minutes to sit and watch the news while enjoying my breakfast before drying my hair. It’s the little things that make me happy! And the spin class was one tough workout (and an awesome way to start the day)! The problem is that I don’t want to spread myself too thin or out in too many directions. I love my yoga studio and it’s where I am doing training and a strength class each one time a week. Currently tennis is at a third park district, but that will be over this weekend. And I have my current membership at the park district 1 mile from our house for the next few weeks that I can renew for cheap at the end of March. Decisions…Decisions! Obviously, I have to weigh out all my pros and cons and check my financials, but I will definitely spend the next few weeks figuring it all out. How do you choose your gym? Does anyone else fall for the high end amenities? Can I keep running, strength training, yogaing, and add tennis? Who wants to meet for a tennis date? I LOVE a new gym! Especially one with a pool-but at least right now we can’t do it. The new gym in Carol Stream opened and although I couldn’t do the full membership-for $25 a year (yes for a year) you can do the track upstairs -. I would rather be outside but this takes away a lot of excuses and is probably a better place to rehab a gimpy ankle. I did make the banana crockpot oats and they were a hit-I had a late meeting last night and they were the perfect bedtime snack! Thanks for another great recipe. You are welcome! The pool would probably be a great place to rehab your ankle. How is to going! Thanks for sharing my new gym enthusiasm!!! Oh I want to try the reformer. So fun! You guys can come for free on the last Friday of the month. Can’t wait!!! With a winter like this, the fancy gym is necessary since I can never get outside to run! 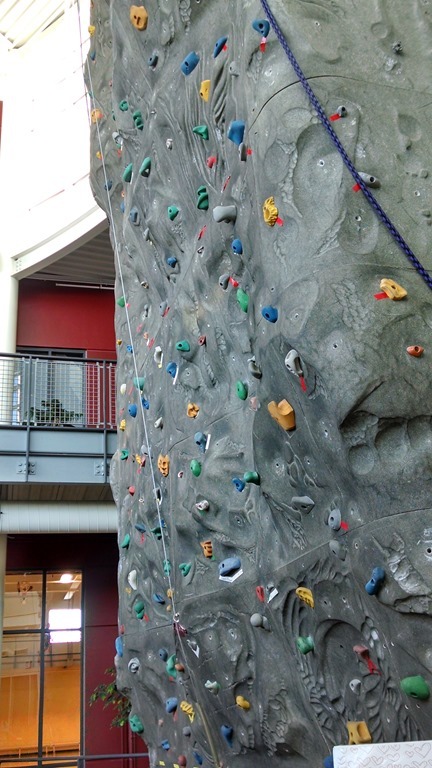 I can’t wait to try out the rock wall! That rock wall would have sold me too! 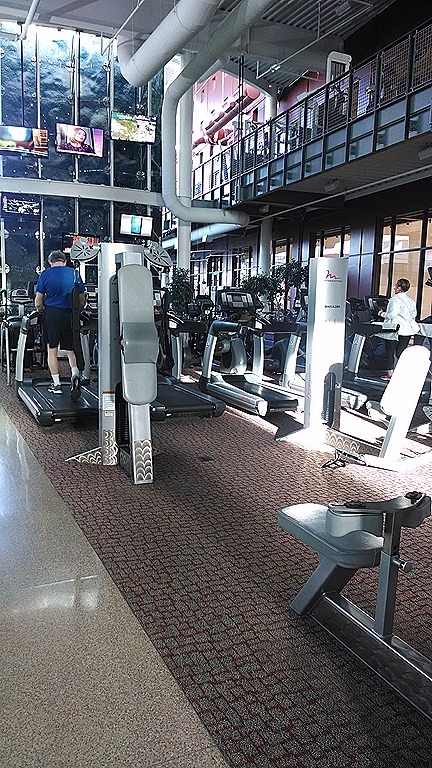 I am a total sucker for amenities, but I’ve had my 24 Hour Fitness membership for 18 years! I only pay $15/month. It’s hard to give that up, even though there are way better options. I real y admire u. I dont know how u do it all. For the past years ive only Been running. Just this week i Began doing HIIT sessions And strength training And i’m sooooo sore. But i’m happy in doing something else because i feel my body needs it i need to get tones And running wont do that for me no matter how far i run. I wont do gyms, got two kids Its too hard And my financials, letal say… Gone are the days to buy stuff for me. Still in proud to be a no excuse mom that juggles work, kids, working out And clean eating. But i get u, it can be a not overwhelming at times. I say, check your financials, make a list of pros And cons And maybe that Will help with your decision. About the tenis? You already have a day dedicated to yoga, maybe u guys should take one day a week for that also. Even if it isn’t an actual class. Yamir, thanks for this comment! I love your suggestions and the pro/con list. It’s so hard to think forward towards warm weather when every weekend brings more snow, but once I can be outside, I won’t want to step foot into the gym Your ability to balance it all is SO AMAZING! Clean eating takes time and with two kids, that has to be tough! Way to go on the HIIT. Those are the toughest for me! It will be great to see how intervals and strength will help your running! 2 pools AND a rock climbing wall? I say go for it!! I would love access to a nice gym like that. I always feel cheated when I pay to use a local gym or YMCA and the equipment is older. That is definitely a plus to living in a bigger area….better gyms to choose from. Oh yes! I feel like we don’t even get the best of it because all the new cool stuff goes to the city first! OHHHH that is tough!! I belong to 3 gyms at the current moment. I probably should not be giving advice!! 🙂 my first gym: it is a big gym that I have been a member at literally forever and I pay basically nothing a year. I will keep it until I die! 🙂 2nd gym: convenience. We have a couples membership(a little cheaper); 2 blocks from our apt; a masters swim and nice pool. I would rather not pay this monthly but its convienient and now I am doing some pi-yo classes!! 🙂 3rd gym: is my coachs gym which really is free to use as I am paying him to be my coach!! But I can leave my bike there; shower; strength stuff!! OMG I love it! We are so like minded which is probably why we get along so well..ha ha! It makes me feel beter for only having two gyms at the moment. I am loving my new gym and we played tennis 3 times in 4 days. This morning I was at spin class. It was brutal and amazing and I loved every minute. I think they have yogalates (kind of like Pi Yo) and I can’t wait to try it!